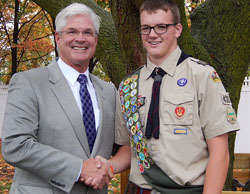 LANSING, Mich. — State Sen. Mike Shirkey, R-Clarklake, honored Eagle Scout Bryce Taber Wednesday at the Branch County Shelter House playground open house. Bryce built four benches and a shed and donated money toward the playground. The Branch County Shelter House is a women’s care center in Coldwater. Note: The above photo is available by clicking on the image or by selecting Photowire at right.